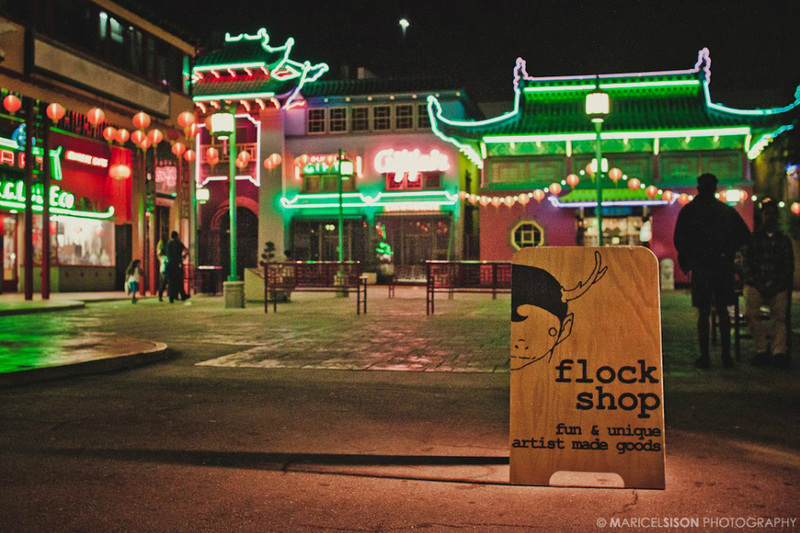 Flock Shop came to fruition as a boutique in the summer of 2007 in LA's Historic Chinatown and quickly became a hub for unique, and often one-of-a-kind, artist made goods. Flock Shop supported & showcased hundreds of talented local, national, and international artists, creating a platform to showcase their work and bridge the gap between artist and consumer. We became a destination spot with an incredible worldwide following. We closed our doors in January of 2013 and are now dedicated to growing our online store, refocusing on our love for vintage! We pound the pavement (so you don't have to!) searching for the coolest "pre-loved" and vintage goodies we can find. Just sit back, relax, and enjoy your shopping experience! Nominated for "2012 Best of Downtown"
Check out our events page from time to time as we may be vending or creating a "pop-up" in a town near you! Flock Shop is also the proud producer of the Funk Rumble Block Party 2009 & the Make It Funky Fest 2010. This grassroots, music & art event combined the talents of incredible bands, deejays, and artists, together in Los Angeles, for a festival unlike any other!